Java provides the cross-platform environment in which Orbeon Forms runs. If you don't have Java installed yet, download it from here. NOTE: If you use a Mac with Mac OS X, you probably have Java already installed on your machine, but if not, follow the instructions in this knowledge base article. 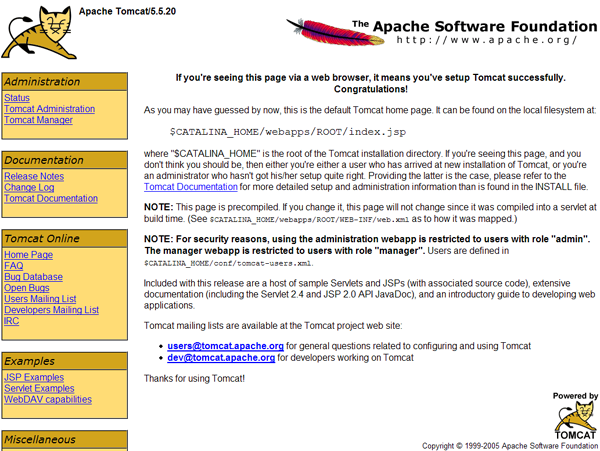 Download Tomcat 6 from the Apache web site. Install Tomcat as per the instructions. If you downloaded the installer version (Windows only), run the installer. If you downloaded a compressed archive, uncompress it to the location of your choice. We call the install location TOMCAT_HOME (on windows, this could be c:/Program Files/Apache/Tomcat, on a Unix system, /home/jdoe/tomcat, etc.). Run the Tomcat startup script under TOMCAT_HOME/bin (startup.sh or startup.bat depending on your platform), or start Tomcat with the control application (Windows only). You should see the Tomcat welcome page. NOTE: We recommend using Tomcat for this tutorial, but Orbeon Forms can deploy into containers other than Tomcat. Uncompress the archive into a directory of your choice. We call that directory ORBEON_FORMS_HOME. 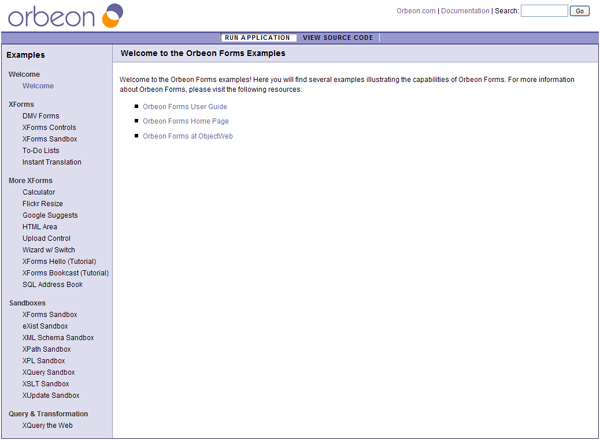 Under ORBEON_FORMS_HOME, you find a file called orbeon.war. This is the file to deploy into Tomcat. To do so, just copy it under TOMCAT_HOME/webapps (alternatively, if you know what you are doing, you can uncompress it at a location of your choice and configure a context in TOMCAT_HOME/conf/server.xml). The webapps directory is already present after you have installed Tomcat.